I have to be honest, I was a little scared when I first arrived in Vietnam. I belong to the slightly older generation who never got the chance to take off and travel the world in our youth. The most exotic place I had visited before was Dubai where finding the local experiences and culture sometimes proved difficult. When my daughter packed her bags and moved to Ho Chi Minh City, I knew this would be my chance to see a bit more of the world. My husband and I decided to take leave and visit our daughter 6 months after her arrival. In this time, she had managed to get herself a job out there so we had a little free time to ourselves. Ho Chi Minh city was a little overwhelming with its constant onslaught of motorbikes and spring humidity, so we decided to take the opportunity to escape and explore one of the more peaceful ways of life Vietnam had to offer. 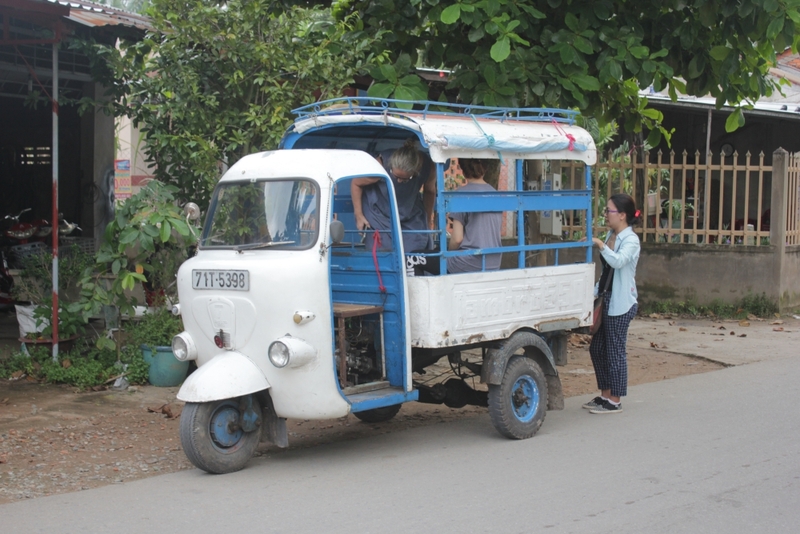 I wanted to book a Mekong Delta tour but was put off by the idea of fighting for shade with crowds of other tourists. I also didn’t want to come all this way just to see something which had been altered and staged for tourists who had come before me. I wanted a truly local experience. To see the real way of life. 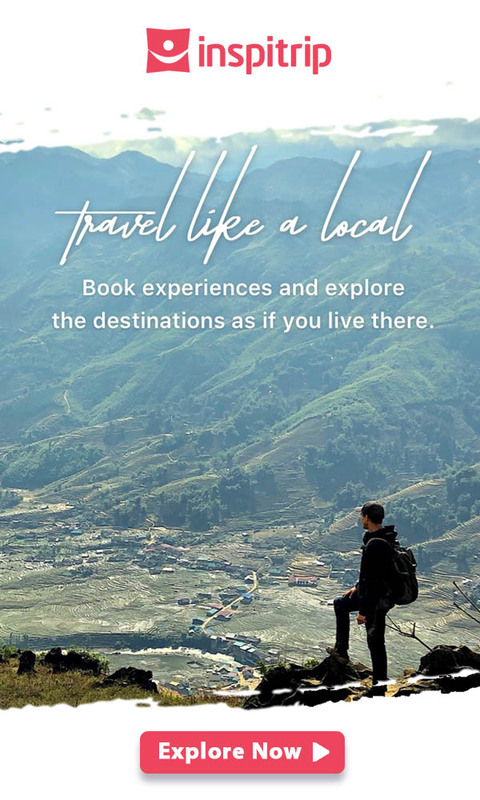 I therefore decided to hire a local guide with Inspitrip. Wandering on Mekong river without traces of any tourist, yay! Our day started early. Vi picked us up from our hotel and piled us into the taxi she had arranged. After an hour and half of driving we arrived to a place where we could sample the delicious rocket-fuel also known as Vietnamese coffee and board the boat which would take us down the river. The only other people around us where working on the boat or at the coffee shop. I didn’t see any other tourists, this set the president for the rest of our truly local day. A day which stands in stark contrast to the photos I have seen from others experiences of the Mekong; a delta crowed with tourists’ boats fighting to get past each other and gawk at the ‘locals’. 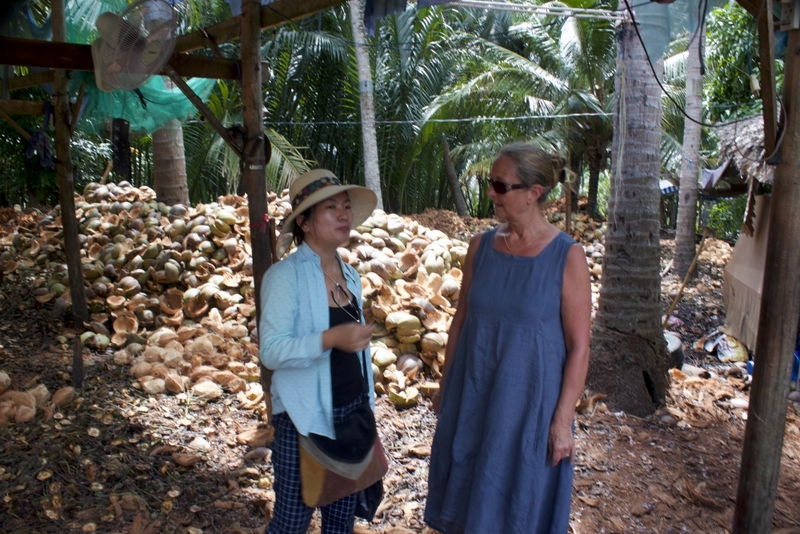 Our first stop was to a coconut “factory” where we saw the coconuts being de husked. I have to admit I have had a few coconuts while I have been here but naively thought they were all produced by near by palm trees, I would have never imagined there to be a coco-cola desk production system. We spoke to the woman who worked there and learn how little she was paid for the preparation of these refreshing drinks. Vi ever so gracefully gave the woman a drink to thank her for her time. We left the boat and on our journey into the coconut grove met an old local lady with a warm smile. She invited us to look around her home and was happy for us to take pictures. She wanted nothing in return, her true warmth and generosity was a pattern we would see in all the people we encountered on our tour. Vi had somehow seemingly arranged us to be greeted by our truck driver at the end of this path. We had a great laugh when this half motorbike, half truck, decided it didn’t want to start until it had seen my husband get out and push. 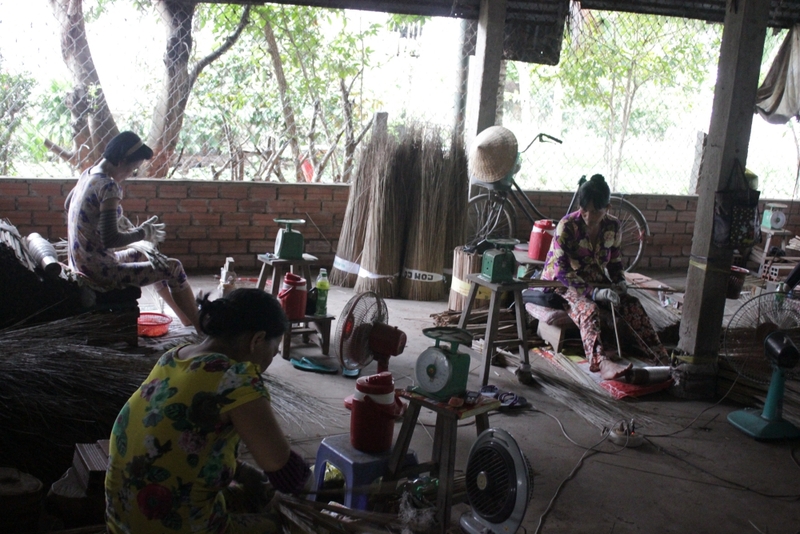 Our first stop was a little factory were women were making brooms, they were happy to talk to us while they worked and allowed us to walk around and take photographs. Next was Uncle Tam’s home. Once again we were welcomed with such warmth we at once felt like we were visiting an old family member. We sat on a veranda deep in the grove and feasted on fresh fruit. There was not another tourist in sight and I can honestly say we felt like we were experiencing something truly special. Once revived we made our way to our wooden paddle boat which Vi had arrange to sit waiting for our arrival. We made our way through the towering mangroves, and by we it was mainly myself who helped Vu, the boats owner, as my husband furiously took photos of it all. Next stop was lunch at Mrs Mai’s. Lunch was one of my first and also most memorable experiences with traditional Vietnamese food. I can still taste the fresh fish and spices now and my mouth is watering, begging me to go back. 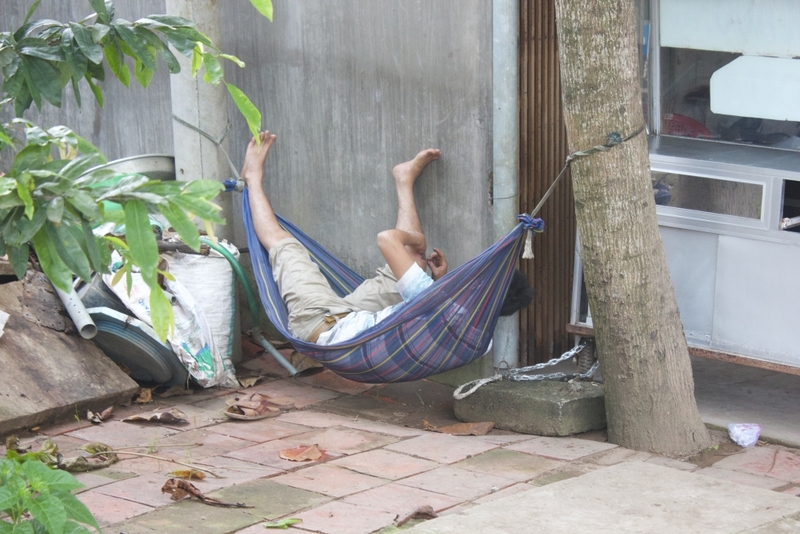 The Vietnamese like to nap after lunch so we took this opportunity to relax before setting off on the bicycles Vi had arranged. From the seat of my bike I could see all parts of local life which took place around the mighty river bed. When we crossed a rickety bridge and were joined by some local dogs and a pig. Music from the houses lifted through the trees to create a beat to our journey. 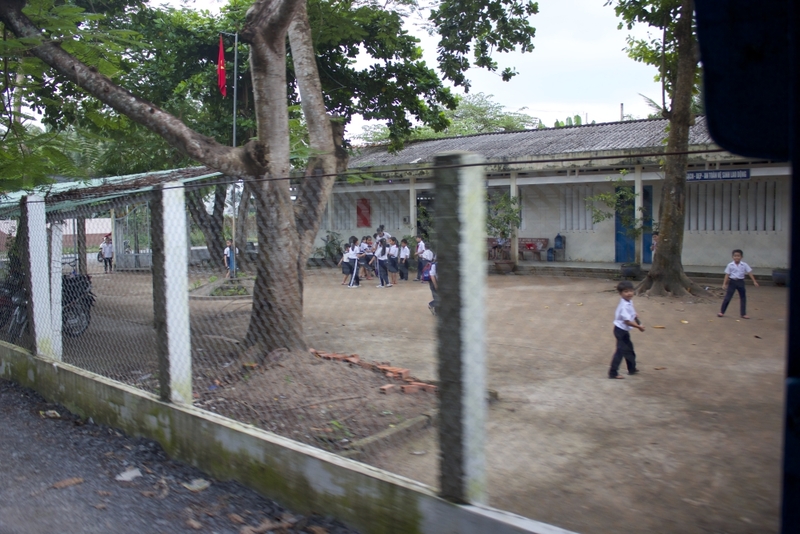 The most memorable moment of the whole tour happened when we visited a local school along our cycle path. The children were so happy to see us, a welcome distraction from their studies. They came out onto the courtyard with us and welcomed us with such warm, wanting nothing in return. Our day ended with our failed attempted to join one of the locals who was climbing a coconut tree. Despite a thorough demonstration from a local man, we all failed at making it further than a meter up. The whole experience was more than I could have hoped for. It surpassed my expectations and was absolutely nothing like the photos you see of a river 5-boats deep with paddle boats for tourists. Everything was arranged so seamlessly that I was astonished it could be done by just one person. 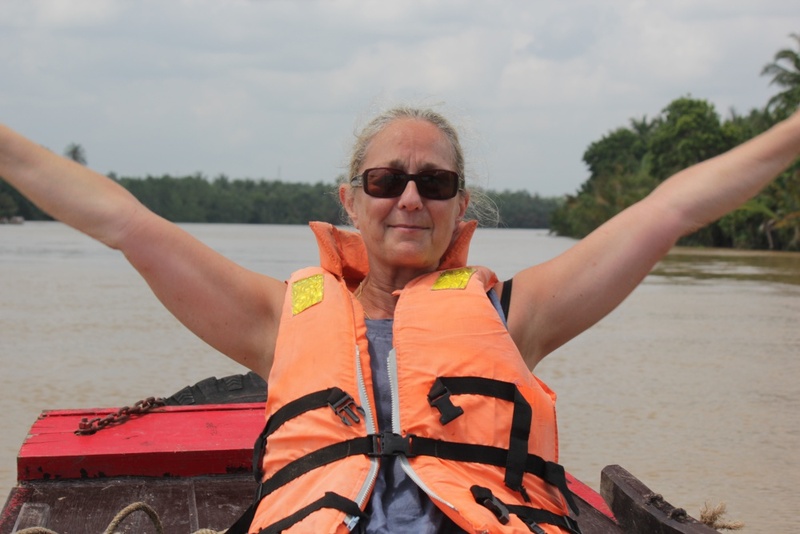 I couldn’t recommend going on the Mekong delta tour with Vi more. When we returned that evening and told our daughter she immediately organised to go. 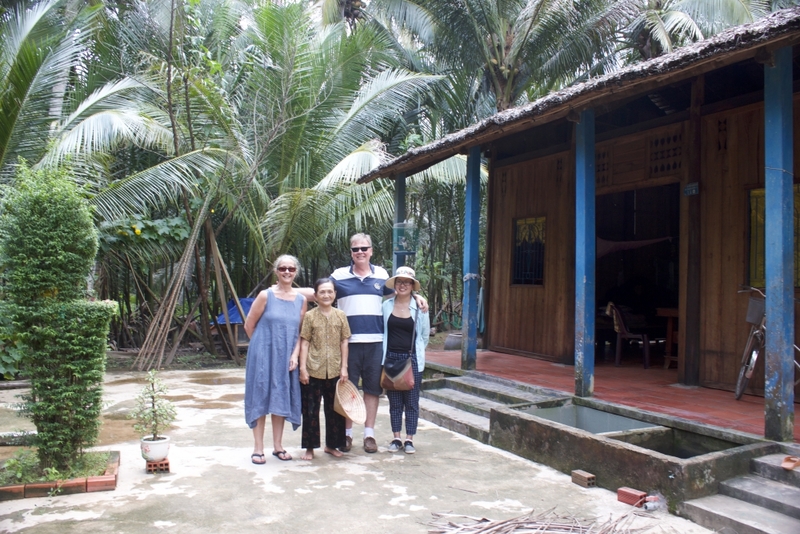 Interested in having an authentic and local experience, visit our website for more details about available Mekong Delta Tour and local guides? The content and images are provided by our beloved travelers Ian and Michelle Travers. 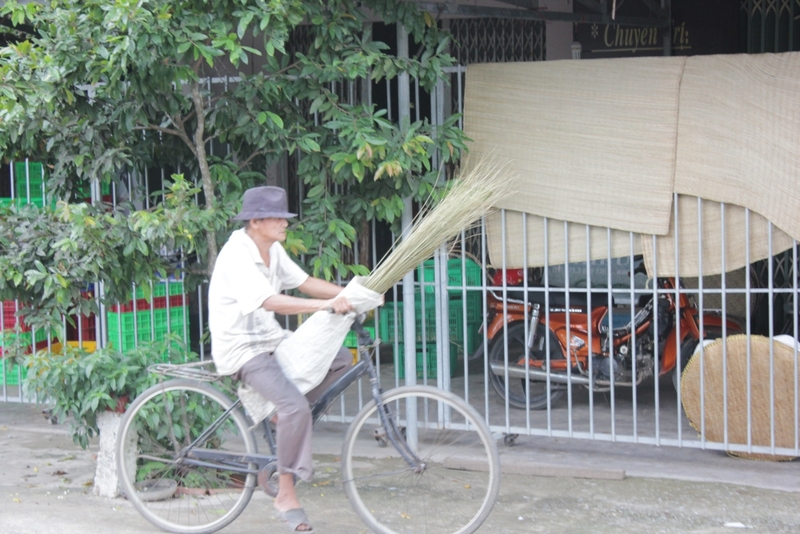 Read another featured story on Mekong Delta tour of Gian, our lovely traveler.